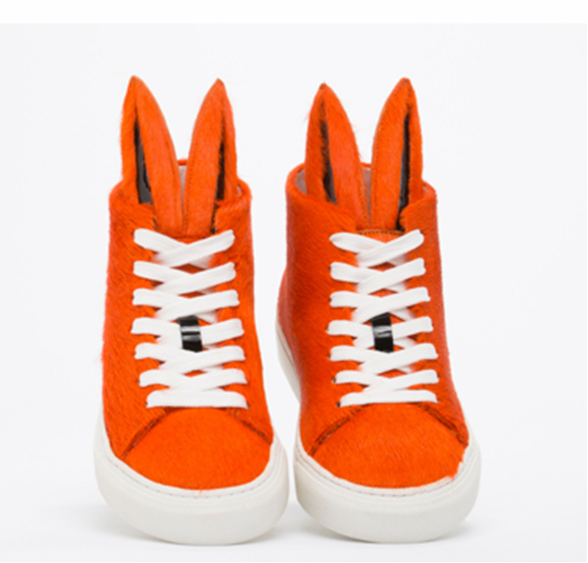 Today's So Shoe Me is the Bunny Sneaks by Minna Parikka, $365, available at Solestruck. Give your feet a haute hop with these bold bunny sneakers by Minna Parikka. A outrageous orange pony hair upper and black leather accents creates a cool customized colorway that will energize any everyday look. These bunny basics will add a cute little edge to your favorite fall separates and the quality materials like pony hair and leather will make sure they last. Pair these bunny eared sneakers with a oversized sweatshirt and slim distressed jeans for a comfy yet chic pre-fall look. So Shoe Me a pair of bold bunny sneakers in a shocking shade of orange that will add a happy little hop to my fall style.